South Africa has big plans to expand its involvement in Africa. 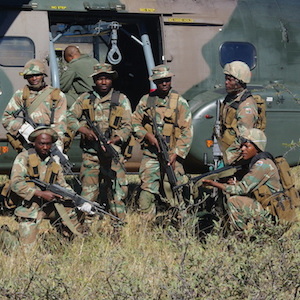 To implement these, Nosiviwe Mapisa-Nqakula, Minister of Defence and Military Veterans, has a vision and a 400-page Defence Review to guide her in developing the capabilities of the South African National Defence Force (SANDF) to match the national, regional and continental role envisaged by cabinet and the Presidency. Yet she will need support and additional funds: quite a lot of it too, judging by the recommendations in the review. While the border security mission presents challenges in terms of present force levels, equipment and funding – up to R1 billion extra will be required to fully equip, deploy and sustain a further 11 companies for deployment to the border, as the minister intends. Indications are that if all goes according to plan, the SANDF could be up to speed to fulfil its commitments at its borders and in the region by 2023. Only then will the real work of renewing the force capabilities start in earnest. In her budget speech on 23 July, Mapisa-Nqakula said: ‘It is also going to be important that the implementation of the Defence Review takes into consideration the tasks and commitments for defence arising from the New National Security Strategy.’ This crucial document, which has been many years in the making, should be the central document to shape policy regarding South Africa’s political, military and diplomatic roles and engagement. Approved by government earlier this year, it has still not been made public – which hinders its role as a policy tool. Government has, meanwhile, tasked the Army with forming a combat group for employment as part of the African Capacity for Immediate Response to Crises (ACIRC), which will in time become the intervention capability envisaged in the Defence Review. In her speech, the minister reiterated the main responsibilities of the SANDF, which include, among others, defending and protecting South Africa, safeguarding its borders and infrastructure and promoting peace and security in Africa. South Africa’s regional role thus remains central to policy, the only question being to which level this is to be pursued. In this regard, the Defence Review’s baseline of three long-term battalion or combat group peace support operations is derived from an assessment of government’s intent and on past experience. For several years, South Africa had battalions in Burundi, the Democratic Republic of the Congo (DRC) and Darfur simultaneously, plus a brief battalion-strength deployment in the Comoros. The minister also referred to the five milestones proposed in the Defence Review as the basis for planning. These are to arrest the decline of the SANDF; to rebalance the force by reprioritising; to ensure capacity meets current needs; to develop capacity to meet future challenges and to build the strength to deal with a limited war. The fifth only becomes relevant in the event of a major strategic shift, but the first two fall within the current five-year medium-term strategic framework. However, the current defence budget – and the budgets forecast for the next two years – will not provide sufficient funding to do that. But, as the minister remarked, ‘many aspects … can be pursued in the short term without additional funding.’ These include various measures to lay the groundwork for the future development of the defence force. In reality, some of these have already been initiated – such as planning for restructuring within the Army. However, it is never without cost, and is more about reprioritising expenditure. The current, short-term programme focuses on succession planning and renewal within the SANDF, and will, in fact, not require much funding in addition to what is needed for proper training and maintenance. Once these aspects have been addressed – and this should be done promptly – funding will have to increase to start the rebuilding. An immediate challenge is, however, the current shortfall in the present defence budget, due to both legacy issues and new operational activities, such as unfunded ACIRC preparations, sustainment of current missions and staff structure. Considering the intent expressed in the budget speech along with what the Defence Review envisages for the first two milestones, relatively limited growth in defence funding should suffice during the current medium-term strategic framework. Real growth will, however, be needed in the second part of the period. The targets set in the Defence Review for Milestone 1 (by 2015/16) that are relevant to the regional peace support role include enhanced strategic awareness capability, which includes expanding and enhancing the Special Forces capability; establishing a permanent forward base in Africa; re-establishing or enhancing a tactical airfield unit capability and a naval port-operating capability; and ensuring that troop contribution obligations are maintained at the standard whereby reimbursement from the United Nations is guaranteed. This is over and above present deployments, which would continue at the same levels. These include the battalion in Darfur, the battalion group and other elements in the DRC, the patrol station in the Mozambique Channel and some smaller elements. The targets set in Milestone 2 (by 2018/19) that pertain to the regional peace support role include developing a joint rapid response intervention capability; simultaneous renewal of the medium and light airlift; in-flight refuelling and air-ambulance capability and enhancing the medium helicopter lift capability. It also includes extended maritime protection capability. Again, this is over and above the present deployments that would continue, and over and above what is set out for Milestone 1. Depending on the detailed force structure and chosen design, and the level of border patrolling to be reached within this period, these interventions and capability targets should be attainable at about 1,4% of the current gross domestic product (GDP), which is about 25% to 30% more than the present funding level. This, however, only creates the basis for an expanded regional peace support operations capability. The actual development of that capability would begin in the second medium-term strategic framework. To evaluate the 2014 budget against South Africa’s regional capability one must also consider this second period, during which the Defence Force would be expected to attain the capabilities of Milestone 3. This would, again depending on the detail and the required border security deployment, take the defence budget to about 1,6% of the current GDP, or 46% higher than the present funding level. By the end of the second medium-term strategic framework – 2023 – the Defence Force would be capable of sustaining three long-term combat group level peace support operations, conducting maritime security patrols in Southern African Development Community (SADC) waters, and conducting a short-term brigade strength intervention operation using air- or sealift. This would be in addition to border safeguarding and patrols of South Africa’s own waters. Only in the period after 2023 would the Defence Force begin with major renewal of conventional force capabilities to be able to respond to a serious challenge in the region. That would see defence funding rising to about 2,4% of the present GDP. While this envisaged defence strategy is desperately needed, and can be seen as a blueprint to transform the defence force into an organisation that will have at least minimum capabilities for its projected role and responsibilities, the big question remains how this will be done.